Exhibition extended until Saturday 1st April 2006 inclusive. Open Wednesday and Saturday afternoons from 2.00 p.m. to 5.00 p.m.
Wednesdays 1st, 8th, 15th, 22nd and 29th March at 2.30 p.m. 1 hour duration. CERN is offering a brand new series of workshops designed to teach the very young all about physics. Through questions, games and hands-on activities based on notions such as weight and the different types of waves, children will be gradually initiated into the world of scientific experimentation. Workshops for 4 to 6-year-olds, open to children accompanied by adults and to groups. Entrance free - by reservation only (+41 22 767 84 84). Wednesday 22nd and Friday 24th March at 8.00 p.m. 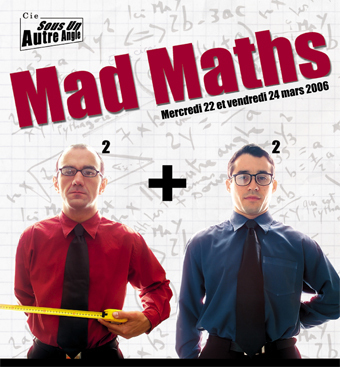 In this mad-cap, off-the-wall show, two nutty professors push mathematics to the limits of reason. The result is a hilarious mixture of poetry and the absurd.